Stunning building with impressive Hindi arts and learning their believes. Sadly no photographs allowed inside. Our guide Sam is very young nice lady, she is very informative, provide many stories behind Hindi mythology, very enjoyable trip for us and she’s a great companion. You'll met your guide at Akshardham Metro station, where your exploration into the religious and historic culture of Delhi begins. Your guide will take you through a walk at the Hall of Values, where the core virtues of Swaminarayan, one of the most famous yogi and ascetic in India, are depicted, giving you a look into the very backbone of the spiritual culture. You'll learn about his life and the great steps he had made for the central Hindu practices, and why he had been believed by his followers as God in manifestation. This is followed by a walk through through the architectural features that are a hallmark of the spiritual culture in the area, such as carved pillars, domes, spires, and more. Each of these features, while aesthetically beautiful, still serve a purpose. You then walk through the peaceful gardens of Bharat Upvan, and the Lotus shaped garden. Here, in the tranquility, you can take time to reflect back on the virtues you've learned. 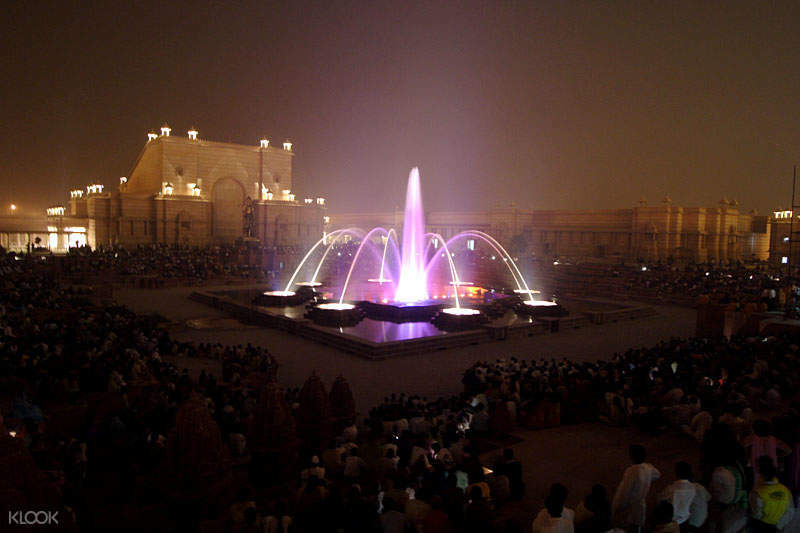 You will be able to watch the Musical Fountain Show of Delhi before you head of to the Shri Swaminarayan Mandir, a place where followers gather to worship and practice their religion. Here you can see the locals at worship, and learn their rituals. Your tour concludes with authentic vegetarian snacks. Stunning building with impressive Hindi arts and learning their believes. Sadly no photographs allowed inside. Our guide Sam is very young nice lady, she is very informative, provide many stories behind Hindi mythology, very enjoyable trip for us and she’s a great companion. Stunning building with impressive Hindi arts and learning their believes. Sadly no photographs allowed inside. Our guide Sam is very young nice lady, she is very informative, provide many stories behind Hindi mythology, very enjoyable trip for us and she’s a great companion. 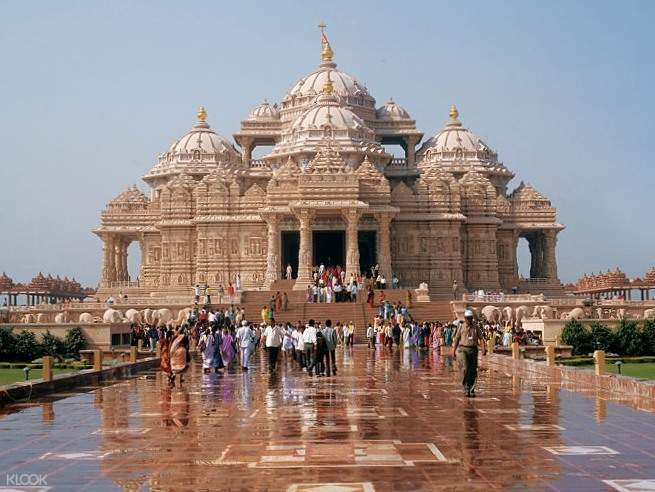 The tour guide is very knowledgeable on the Akshardham temple. However, it was a bad timing as I went during a long holiday weekend in India and it is always crowded in the evening. I did not get inside the temple as I was found with a phone charger on my bag. I decided not to go through the lines again. I just had the tour guide give me the history of it outside of the temple. The tour guide is very knowledgeable on the Akshardham temple. However, it was a bad timing as I went during a long holiday weekend in India and it is always crowded in the evening. I did not get inside the temple as I was found with a phone charger on my bag. I decided not to go through the lines again. I just had the tour guide give me the history of it outside of the temple. The temple was incredibly spectacular to look at and our guide was sweet and shared interesting stories regarding the Hindu mythology and religion. No phones and cameras are allowed inside, shame because of its picturesque scenery. The temple was incredibly spectacular to look at and our guide was sweet and shared interesting stories regarding the Hindu mythology and religion. No phones and cameras are allowed inside, shame because of its picturesque scenery. No tour was held. The operator did not even bother to contact me regarding the tour being cancelled or not. I was just waiting in the meeting place with no contact number to call to because it was mentioned that operator will be the one to contact the joiners. No email yet on klook how to refund the fees. No tour was held. The operator did not even bother to contact me regarding the tour being cancelled or not. I was just waiting in the meeting place with no contact number to call to because it was mentioned that operator will be the one to contact the joiners. No email yet on klook how to refund the fees. Thank you for raising your concern to us. We sincerely regret to hear that you had unsatisfactory experience and we take your feedback extremely seriously. Your case has been noted and passed to the local operator for further investigation. Our specialist has already assisted you with this query. Your understanding will be much appreciated. Thank you for raising your concern to us. We sincerely regret to hear that you had unsatisfactory experience and we take your feedback extremely seriously. Your case has been noted and passed to the local operator for further investigation. Our specialist has already assisted you with this query. Your understanding will be much appreciated.